This weekend I spent time talking to this lady. She explained that her husband will not go up to the house with her. This was her second time back to her home and she said it will be her last. She was able to find a jar of coins and that was it. For them, the heavy lifting starts now as they try to figure out what’s next in their lives. There are signs of hope. Those with insurance are going to rebuild. This lady explained to me that they’d just finished a remodel after a year and a half of hard work. And then the fire. 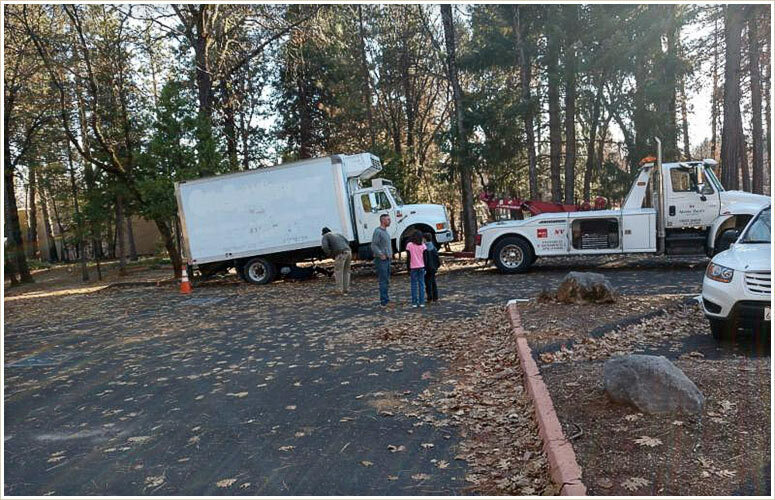 She and her husband are going to move a trailer onto their home site and start over. I’ve spent countless hours driving back and forth, trying to find solutions for people that seemed so far away. But, progress is being made. Slowly, but it’s progress. We found a room for rent in Chico for a couple I call Chico Car Key Couple. I have lots of people in my contacts and I have little acronyms that help me remember where I started with them. James and Sandra (their names) had their car keys stolen at the shelter, so I had a locksmith make them a new car key. Hence their name. I found a room for $350.00 a month. Thanks to your donations, we’re going to pay for two months while they look for jobs. 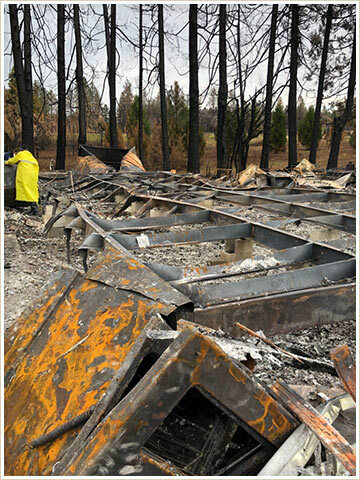 They had stayed at four different shelters since the fire. This may not seem like monumental progress, but I had been working with this couple since the very beginning and it feels gratifying to see them start to step forward. The Red Cross shelter will close January 31st. I’m working to try to find other solutions for people within the shelter. It’s so difficult, but like James and Sandra, I’m not going to give up. January 3rd, Chico Tattoo Gloria and Ralph as they are known in my contacts will be leaving Paradise for good. Thanks to your donations, airline tickets have been bought and they will start their new life in Arizona. Ralph’s parents are very elderly and it’s time to go home, he said. It is because of you and your donations that a new life can start over for them. 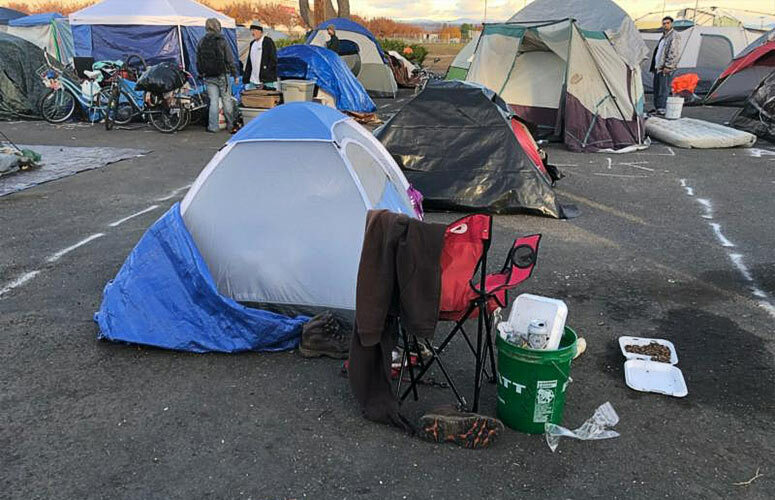 On the 29th of December I will be meeting a couple on the side of the road along I-5 to pass along money needed to drive their family to Idaho where a new job is awaiting. It took a long time for a new path to unfold for them. It is very satisfying to be part of a solution. Jasmine and her kids have moved back to their home in Magalia, no longer living out of her car. The clean up process has started and your donations are helping to complete this journey for her. We still have a family in a hotel locally. Many layers of the onion have been peeled and I hope that this time next week I’ll have the last layer peeled. 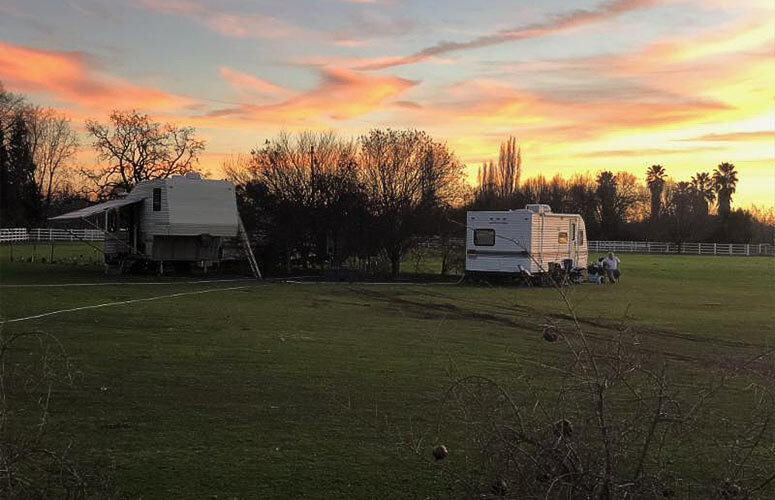 There are about ten trailers set up at a property in Durham. Kim and Henry have done a tremendous amount of heavy lifting to accommodate the trailers on their property. As these families settle in, your donations will continue to help with basic needs. A single mother of three, staying in two trailers on the property is hopefully going to move to this area. We’ve been able to locate an apartment and, if all goes well, I would like to give her a job. 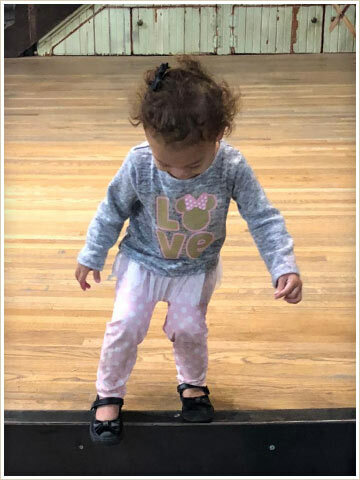 We will get her connected to the necessary services that will help her to get a new start. Her job in Paradise and home are gone. It’s my wish to make High-Hand her new home. There’s been a lot of heavy lifting in Magalia. 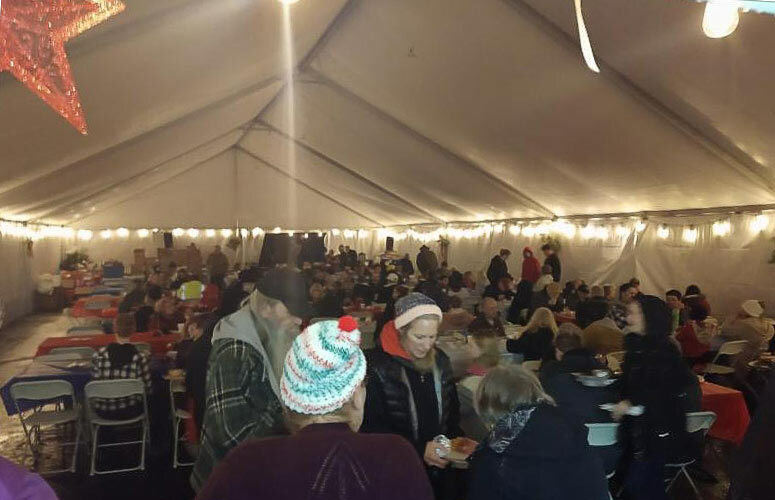 Refrigeration, a heated tent in which to serve food and food distribution are going very smoothly. 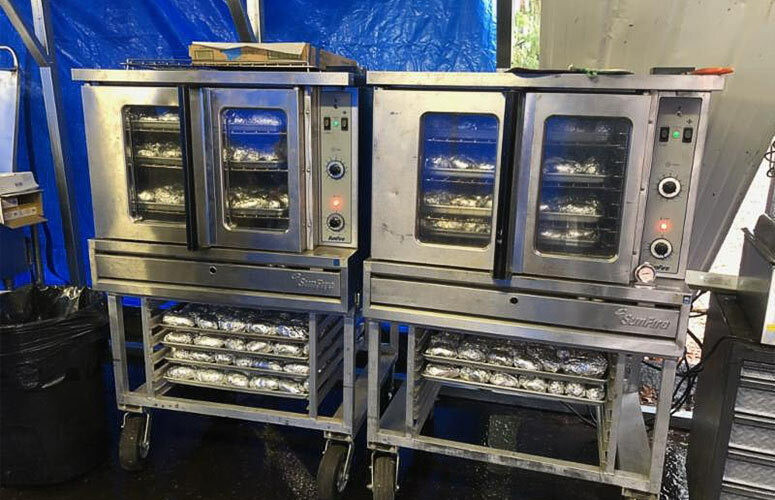 Your donations helped deliver prepared food for Christmas Eve dinner. A nice time was had by all on a rainy, foggy night. All of you should be very proud of your donations and what they are doing for people. 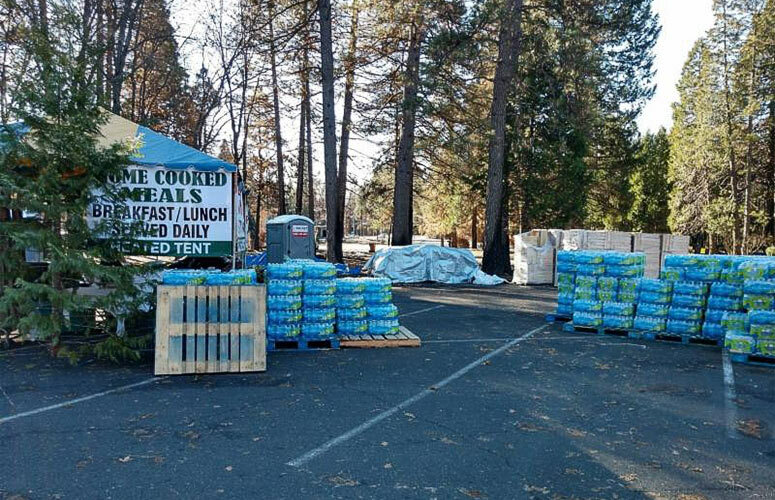 Twelve pallets of water were delivered today. Besides food, your donations are paying for water, pellets for heating and propane for cooking and keeping the tent warm. With all this heavy lifting has come progress at the church. We’re now focused on helping them get through the winter. There are still many families out in the fringes living in cars. I wonder when the media goes away what will happen. We’re going to continue to work with Pastor Doug in Magalia and Pastor Ron in Chico to find solutions. 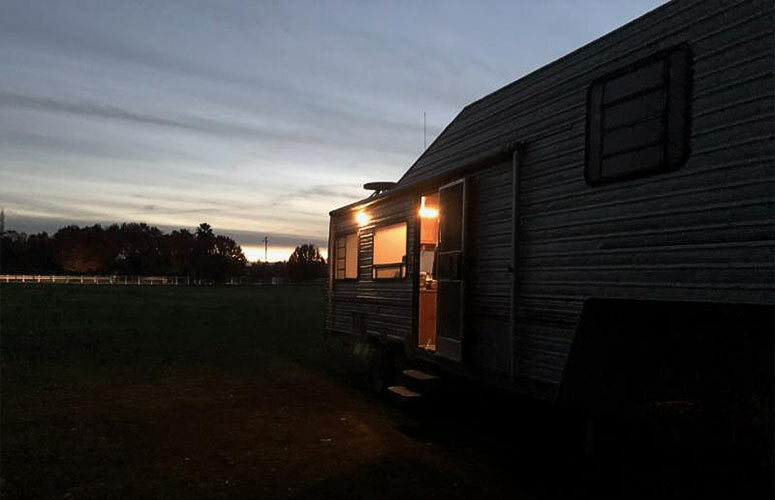 Your donations are being used to create matching funds for trailers so we can continue to move families into more sustainable living conditions. We have been able to donate a few cars and a trailer. I was happy to learn that today a father got a job and drove to work. So, it is happening. Slowly. But I warn you, when the media goes away please understand that the heavy lifting has just begun. Through your donations we will continue to do everything in our power as long as we can or until every need we can find is resolved. We are continuing to accept donations. 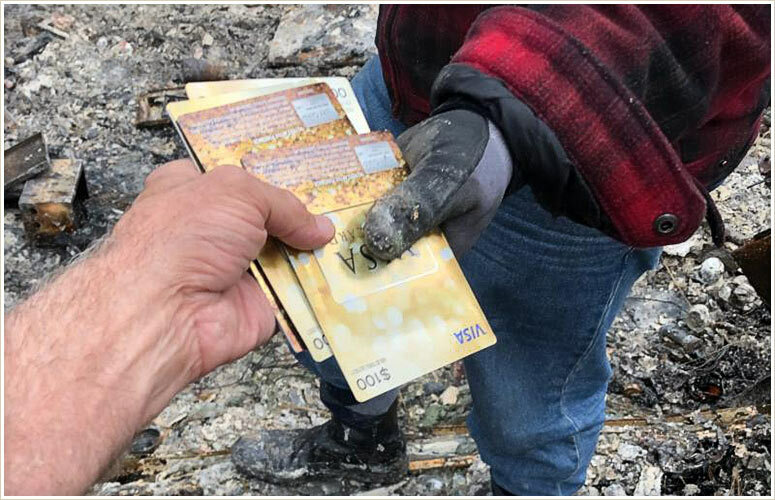 Gift cards, gas cards and money to keep all of this funded through the winter. Thank you so much for going on this journey with me. Since the beginning of the Walmart parking lot, I’ve been going to shelter to shelter to shelter. Some times I feel like a gerbil turning on a wheel. It’s gotten to the point that I recognize the faces when I come across them at the shelter at Silver Dollar Fairgrounds. Silver Dollar is the last shelter for the most part. Red Cross has consolidated all their shelters down to one. I guess that’s good news. I’m continuing to work with several people within the shelter to see if I can be part of the solution for them. Fixing cars, renewing registrations, car insurance, helping with driver’s licenses, picking up the mail. All the things you and I take for granted. These are things that when you are in a shelter are monumental tasks. A couple of weeks ago I helped Alejandro and his baby boy in the Oroville parking lot. After talking with Alejandro we decided that it was best for his child to go live with his mom for a while. We’ve determined that his truck is not salvageable after being driven through the fire during their escape. Liquids in the truck boiled. He has managed to get a job as a security guard at Feather River Casino working night shift. We talked about him moving to the shelter for now. At least it’s warm. Your donations helped him buy a $500 car today and two new front tires, an alignment and an oil change. I have to think there’s hope for him. He’s certainly working hard to get back on his feet. One of the struggles of being in the shelter for Alejandro is that he works the night shift at the casino. The security guards hassle him when he leaves for work. There’s a curfew at the shelter. Seriously? A security guard hassling another security guard? 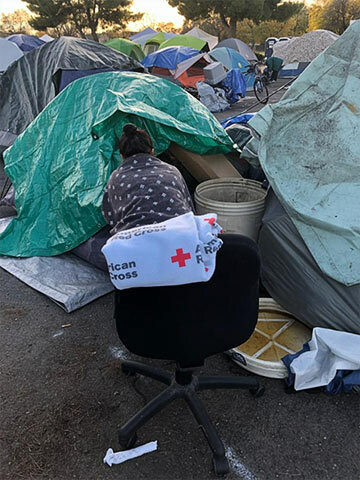 The Red Cross shelter is not an easy place to be, contrary to popular belief. 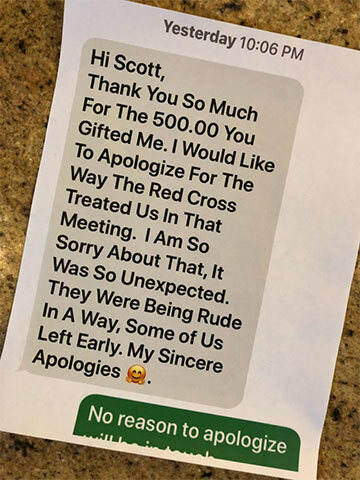 I got a call today from a Red Cross volunteer who quit. He lasted five days. We talked extensively about the issues which I won’t repeat. This makes me sad. It makes me sad at the way people are being treated. And in the faces I’ve come to learn, despair seems to deepen, but I have to think there is hope. At the Silver Dollar I will continue to work with everybody I come across who continues to help themselves. This will not stop until the shelter closes. Since the beginning, we have shipped five semi-truck loads of hay and grain for the animals. We are continuing to support the animals. Things have been fluid since the very beginning. Our feed for the animals is now being done through a feed store. The owners of animals that are in need can come to the feed store and pick up what they need. The bill is sent to me and is paid. We are very careful to make sure that there is a true need and that other resources have been exhausted. It’s a simple, focused way of distributing the food straight to people in need. This will continue most likely into the Spring. Our focus is to get the animals through winter. These needs are being met thanks to your donations. In Magalia, Pastor Doug is now feeding hundreds of meals a day. Last week the refrigeration truck arrived. 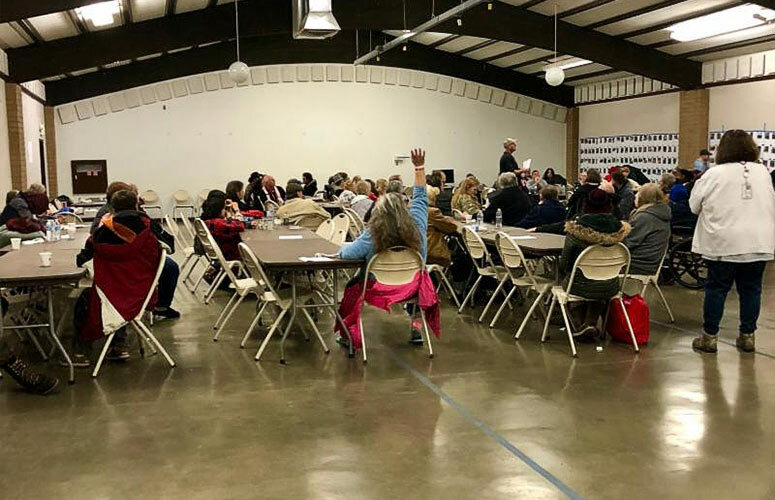 Pastor Doug can now call a produce and meat company and food will be directly shipped to a distribution point in Chico. From there Pastor Doug picks it up. This is working out very smoothly and efficiently with no extra waste of energy or resources. This week an 40’x80′ heated tent will be erected to feed 300 at a time. Right now they eat out in a cold tent with no sides. I would like to thank Tony and Celebrations for making this happen. We will be preparing dinner for 600 on Christmas Eve thanks to your contributions for restoring hope. 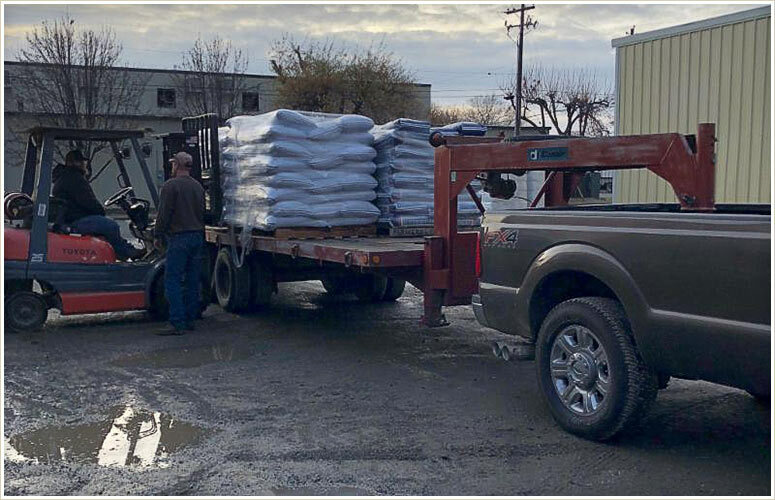 We have purchased ten pallets of pellets for pellet stoves which are being picked up by Pastor Doug at our feed distribution site. Heat is an issue. People are cold. On Saturday I made contact with two out of work individuals from Magalia who had lost their chain saws in the fire. They used to cut firewood to make extra money. Your donations have purchased two chain saws necessary to fulfill the need for firewood. The deal I made with them was that half the wood would have to be distributed to people in need and the other half can be sold to customers in Chico. I hope you approve of this donation. It seemed like a win win for everybody involved. This gave them hope that they could be in control of their world again. The needs in Magalia for people in need are really quite simple. It’s gas money. Gas money gets them to and from the services in Chico. There are no stores available up there. They are all gone or closed. With no people there to shop, it will be a long time before they open. There’s talk about the hospital opening, but there may not enough patients to pay for staff. Sterling City is basically a town unemployed. All jobs lost. I got to speak today with a person at Teigert who informed me that they were bidding on cleanup work. I had asked her to consider having a job fair once things got started. Pastor Doug was open to holding it at the church. I hope my suggestion is taken into consideration. Our work in Magalia will continue through the winter. Your donations of gift cards and cash are the lifeline and I can’t thank you enough. I will continue this work until Pastor Doug says that we can take the tent down. That will be the first symbol that hope is being restored to the area. Traveling through Paradise and the Magalia area is very sobering. There’s so much despair in people’s eyes, but as the initial shock starts to wear off, the gravity of the situation in Paradise is settling in. 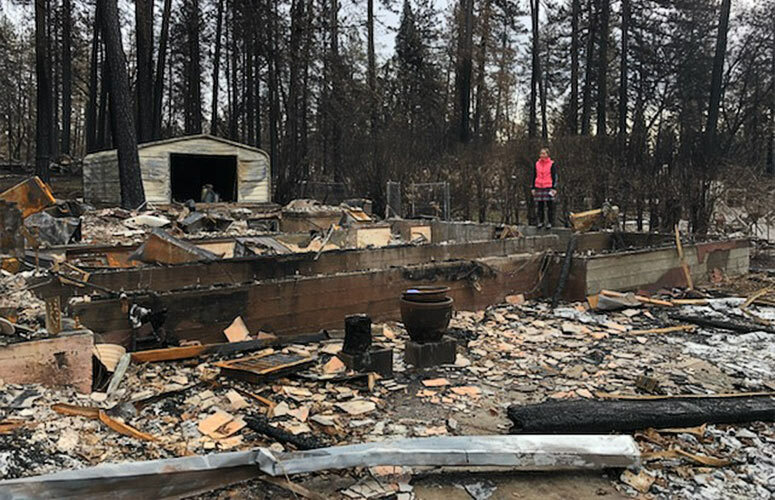 People were able to return to Paradise on Saturday for the day to get a look at their burnt out homes for the first time. This gentleman returned home Saturday for the first time. He lost everything. I mean everything. He had rented the house for over twenty years. He had an internet business repairing espresso machines. He lost his inventory and twenty years of tools and parts. He lost his furniture, his library, and all the school work that he had saved all his life from when he was a child. His last name is Smile. It really is. There was not a lot I could say to him. He was shaking when I walked up to him and I just quietly listened for about 20 minutes while he spoke. He lives in a car currently. I will remain in contact with him. There has to be hope. 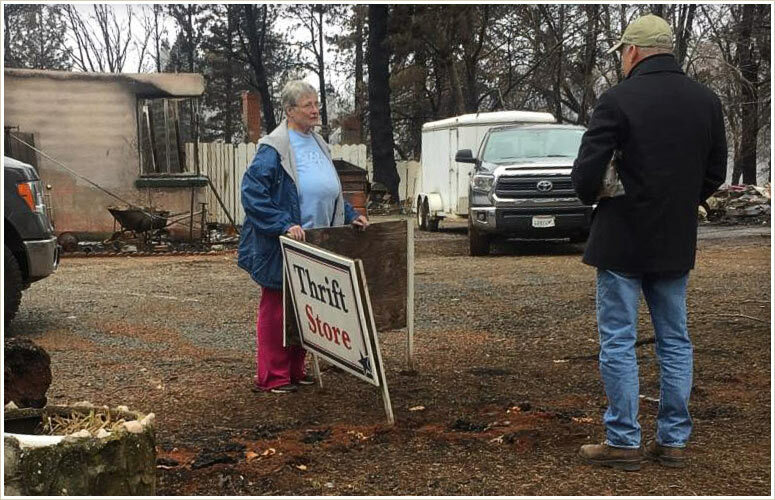 This very nice lady returned to her burnt out trailer looking for only one thing, her husband’s cremated ashes. She found them to great relief. She lost her thrift store. I asked her if she had insurance and she said she did, but the insurance company said they wouldn’t cover her because they had not received the check for her premium. She speculates it probably got burnt up at the Post Office. I told her I would call her in a couple of days and that maybe I could help her sort this out. Understand that people are in a fog and they don’t know how to advocate for themselves at times, looking through the lens of despair. I know there is hope for her. We’re just going to throw some elbows and see what happens. 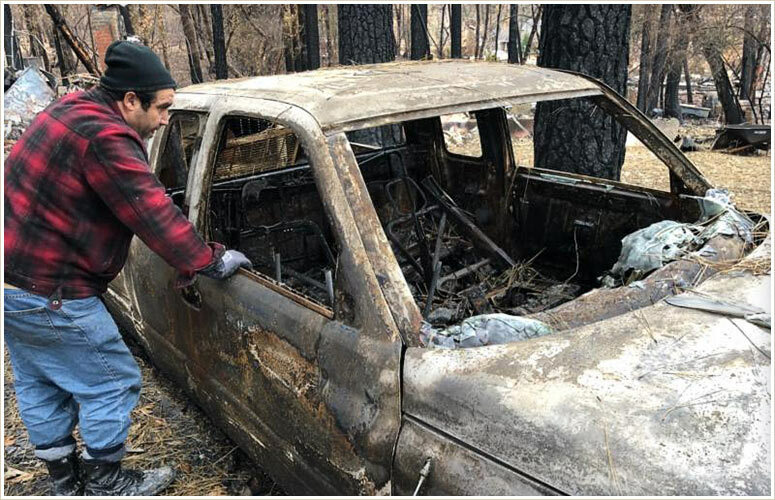 This gentleman searched through his trailer and found one item that survived. A plate. A simple plate. I think the plate is more than just a plate to him. It’s a symbol of hope. As he washed the plate my heart broke. From the ashes and all this insanity — there is hope. 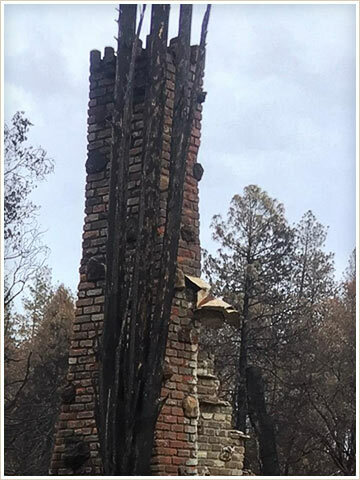 This chimney is the only thing left standing at the trailer park. I’ve modified the picture greatly because this trailer park is where five souls were lost. I spoke to a lady going through this home where she lived. Nothing survived. She told me she found her dad’s ashes sitting on top of the stone mantel of the fireplace. The wood box they were in had burnt, but the ashes remained. It was really the only thing she had wanted. It seemed to bring a small glimmer of hope to her face. She told me her dad was a tough old bird and this proved it once and for all. It’s a crazy world out there, but your donations have been handed to scores of people and with your donations the strength of hope. 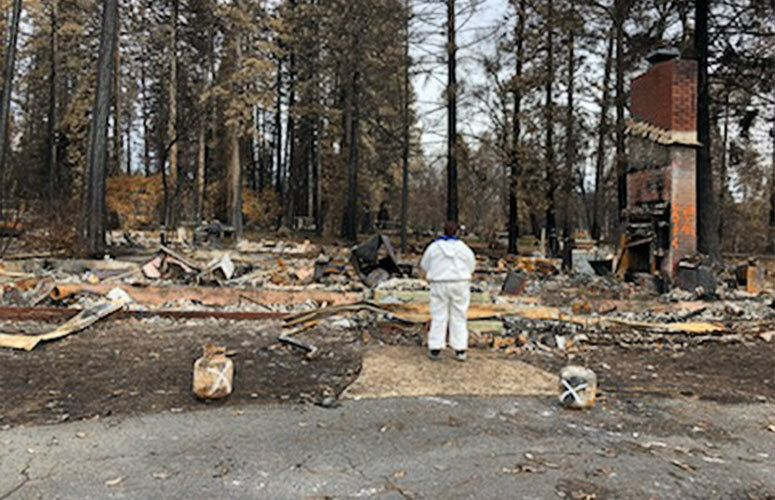 My hope is that the Camp Fire victims will not be forgotten once all the roads are open and the media is gone. That is my hope. I was asked what I wanted for Christmas. There is nothing. I still can’t even think about that. How could I want for anything after so many people have lost everything? I would like to wish you a Merry Christmas. On behalf of the many people that your donations have touched, we say Thank You. With your donations and kindness hope is slowly being restored. From the High-Hand Family to you and your family, Merry Christmas. The night the fire roared towards Magalia, the First Baptist Church stood in its way. I cannot imagine what Hell looks like, but from outside the front door of the church Pastor Doug and thirty others stared at Hell. 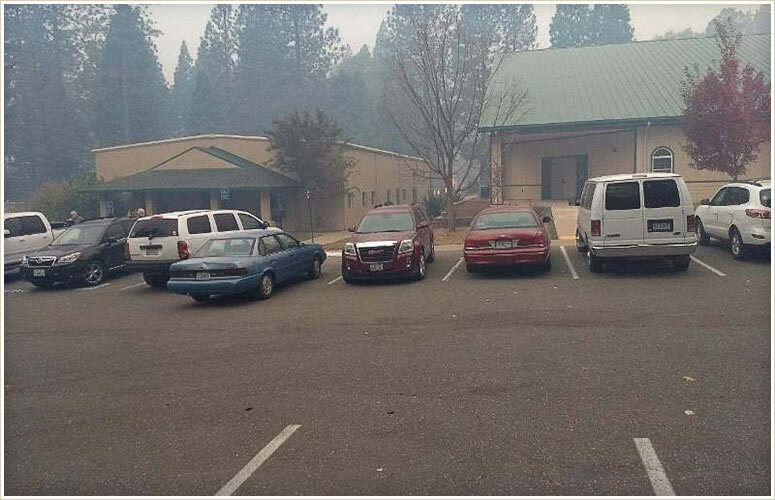 Believe it or not, this is the church the next morning as the fire burnt and destroyed everything around them. You have to say that this is a miracle. Everything around this church is gone. We talked on the phone throughout the week about his needs. He needed food. He explained that there were people up there who had stood their ground and were camping in their houses instead of going to the shelters. Looters have been a concern. Personally, I’d rather be in a cold house without power than the Walmart parking lot in a tent. As I thought this through I asked him about refrigeration. I told him we could send food, but if we can’t refrigerate it what’s the point? I made some phone calls and started the wheels in motion. I and my daughter Tara drove up the back way to Magalia on Sunday and we sat with Pastor Doug in his sanctuary. It was a quick conversation about immediate needs. I had been thinking about the logistics about getting food to Magalia all week long – refrigeration, dairy, eggs, produce and meat. Today a refrigeration truck was towed to the church. In the back of the truck was the start of our food supply chain. Tomorrow your donations will be delivering fresh meat and Cambros. Cambros are a container used for storing hot liquids. They are limited up there. Before we could send food we had to create a way to keep it refrigerated and fresh. I have not done this much in our emails, but I want to personally thank Jim and the entire Produce Express family. 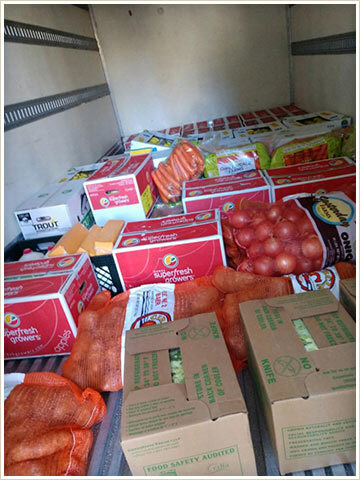 The Produce Express family made a direct cash donation to the work with the Camp Fire victims. When I called Jim to pick his brain about refrigeration, the next day he came up with a solution. 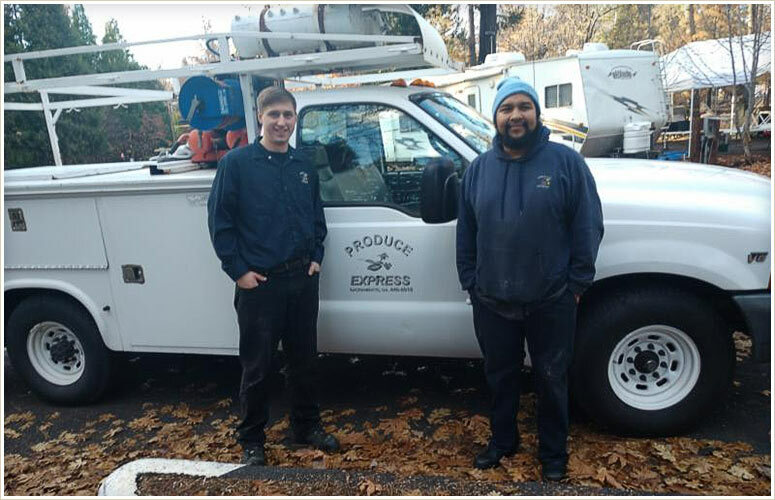 He towed up the truck and sent a crew to make sure the refrigeration was running properly. 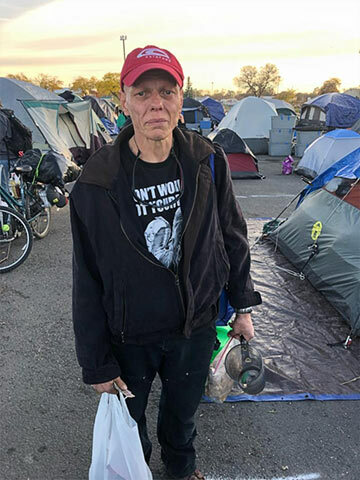 Jim, you have helped do something for the people of Magalia that the agencies and government could not recognize and could not act fast enough. Every day counts. People are suffering. Last week a conversation was started with the Pastor in Magalia. Today a refrigerator truck is there and the food is starting to flow in. Over the next two to three days, I will work on organizing the supply chain to get the people of Magalia through the winter. Your donations are going directly to this cause. When I talked to Pastor Doug on the phone I could hear and worry and uncertainty in his voice. I had to go see it with my own eyes. It’s no joke up there. They feel forgotten. We’ve adopted families and people. Do you want to adopt a town with me? With the food starting to flow, we are now trying to acquire other needs for the residents there. I am tasked with acquiring 500 pairs of leather work gloves and work boots. Women’s sizes 6-8 and Men’s sizes 9-12. 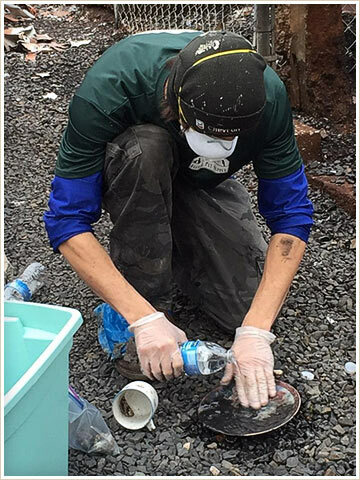 Food, work gloves and work boots to start the long process of sifting through their burnt homes. In the coming days we will determine other needs and fulfill them. Your gift cards have already been distributed to them for gas and other individual needs. This is Rebecca in the shelter. I have spent time at all the shelters as they opened and closed. 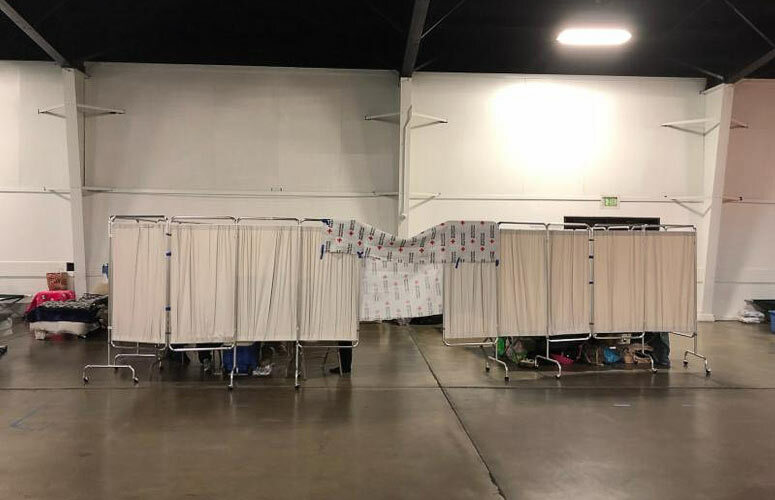 The last shelter still open is in Chico. 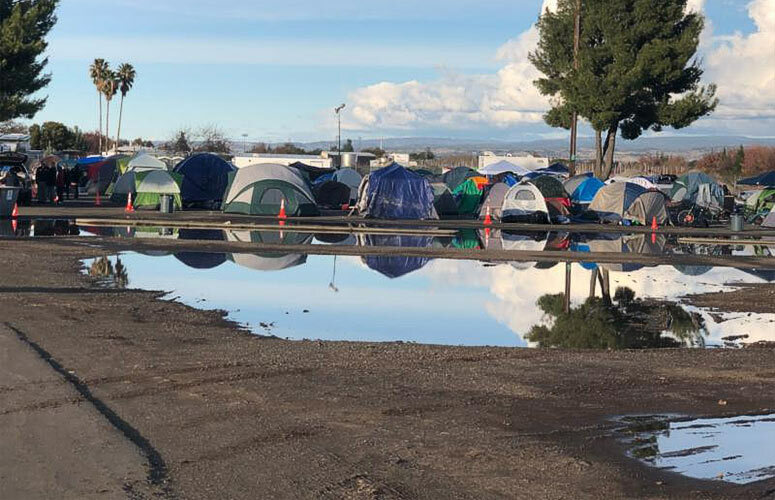 Your donations have helped remove people from tent area. Tara and I walked the tent area last night and there are no more children remaining. In the Women’s dorm, we are working with getting three ladies out of the shelter. A student from Butte College, a lady that had a job interview today and an elderly lady needing help to find a car. She has the money for the car, but because she’s at the shelter it’s difficult to make such a transaction. In the medical area, we got Joe what he needed to get his cell phone reactivated. The free phone he was given at the shelter expired today and without a phone he was afraid he would lose contact with the doctors that will be doing surgery on him in two weeks. My trip into the shelter – here’s Joe passing time on the guitar. 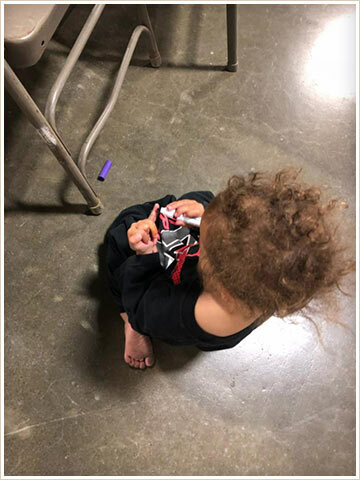 In the family shelter, a young mother, three months pregnant, her five year old and one year old have been removed and relocated to a hotel in Rocklin. We are working on connecting her to the services she needs and getting her life rebooted. We are helping an elderly couple with their vehicle registration and the repair of their vehicle she wrecked while driving her and and her husband to safety. Last night we came across a lady crying. I woke her. We spoke to her. She called me today from the new cell phone she has. Thanks to your donations, she can now make the calls necessary to start the process of rebuilding. I’ve put her in contact with a lady up there who might be able to give her temporary housing. We are working with a family of seven. They are in the shelter. They are awaiting word on their house in Magalia and waiting for a FEMA appointment. They’ve been waiting in the shelter for almost two weeks waiting for a FEMA inspector who had visited their house to get back to them. It turns out that it’s possible that it was not a FEMA inspector, but a looter. 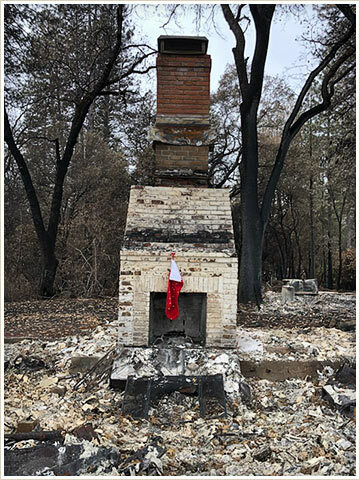 Their house survived the fire. They now have to wait for another FEMA inspector to schedule another time to meet them at their home. I will be traveling to that house on Saturday to take a peek and figure out how to get them back in. When FEMA finally gets there they will make a list of things they need to fix prior to them getting occupancy. It’s usually smoke damage, moldy furniture, and bad carpet. Your donations are going to help with this process. Why don’t we go fix their house? It’s not going to take much. Just effort and love. There are so many others you have helped thanks to your donations. I’m continuing to identify families in the fringe areas and will pass those stories along in emails to come. This is Rebecca at High-Hand. Your donations have possibly changed her outlook in life. As we start to work with her and her mom we can only hope that the kids will grow up never knowing what happened. I will continue to keep an eye on the shelter. There are 14 individuals who I’m working directly with to help them over the Everest they face. 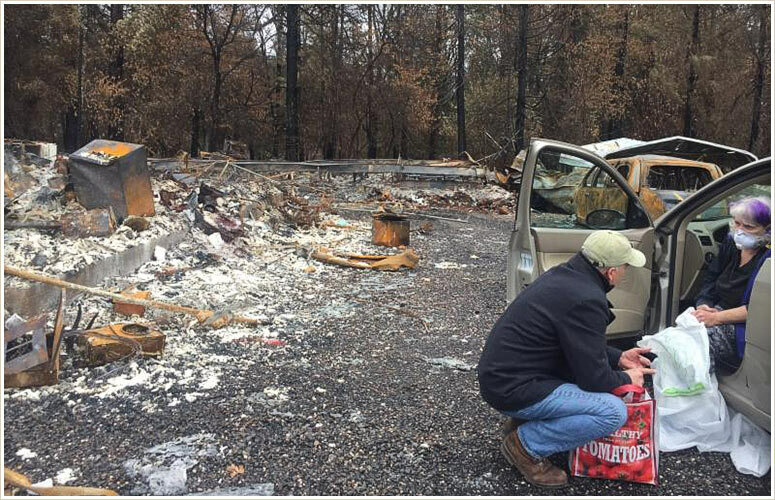 While I keep my eye on the shelters and the families in Chico, along with some of the families locally that your donations are helping, our energy will be focused on the back towns of Magalia and Sterling City. People are combing through their houses. On my way up on Sunday, we stopped many times to distribute your donations. When the fire came through, people fled in all directions. 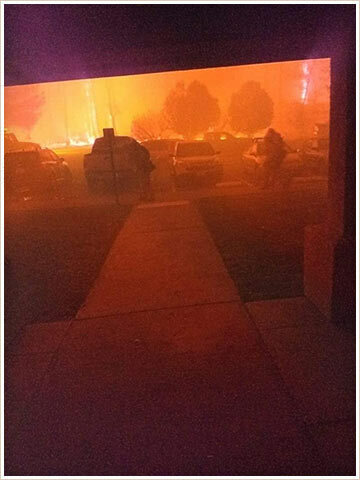 There are people beyond Chico, living in the fire area on the back side. Your contributions are going directly to them now. With all the attention going to Chico, your donations have been put to work promptly and precisely. I will ask you again. Would you like to adopt a town? As we drove up I had to stop and take this picture. As sad as this is, it is also an image of the strength of the human spirit. I would like to talk about the nursery and the things we do here at High-Hand, but there’s work to be done for our neighbors and the time will come for the nursery to be spoken about again. On behalf of the staff at High-Hand, we can’t thank you enough for your support. Your donations are making an impact and I will continue to use them wisely. How Come This Is Happening? I have traveled from shelter to shelter to shelter. As shelters have been consolidated, people are being moved three and four times. I’m confused. How is this happening? This shelter was set up this weekend. It consists of a dorm for males, females and families, all housed separately. And there’s the tent area. The outside area. How come this is happening? Is this the best we can do? An office chair and a towel? On the first night of the shelter opening a man was evacuated to the hospital with severe hypothermia. He was in the black tent in the distance. He was found by a security guard. How is this happening at this point? The same security guard told me to not give gift cards or cash to the organization. They will either send them to headquarters or use them to pay volunteers. This is the third time I’ve heard this – I hope this isn’t true. How is this happening? I was at a meeting where folks were introducing themselves to the evacuees. Understand that I’m not trying to pick a fight or imply anything, but I am wondering how this could be happening? I have traveled from shelter to shelter to shelter. I have seen them open and close them. I have seen staff come and do wonderful things as volunteers. I’ve seen them leave and go back home to be replaced by others. So, it confuses me as to why, when they are consolidating shelters down to one center, how they can be short staffed. I spoke with a young lady at this meeting. 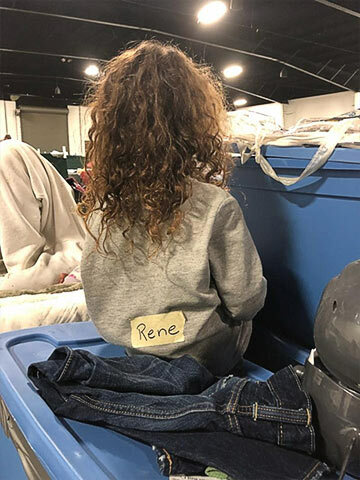 With five kids at the shelter and nowhere to go and a car broken down, she explained to me some of the frustrations with the system. This was her third shelter. She needed to get her kids to school, but her car was broken. She also was trying to get through “the process” with the various organizations. I asked what she thought of what was being said tonight. She said it’s the same thing over and over, just like a recording. I don’t know why she felt she had to apologize to me. I felt I had to apologize to her. Your gift of kindness helped solve her immediate problem. We hugged. I exchanged phone numbers with her and told her that I would keep an eye on her. There are very caring, wonderful, compassionate volunteers working to serve people. A family of seven lives here. They are waiting for “the process” to work out. Your donations went to work last night and this family can’t thank you enough. They had no cash whatsoever. In the family area there are so many people in need. Your donations were put to work once again. This is a young family that I have been working with since the Walmart shopping center. I can’t tell you how many layers of onion I had to peel to get them to a warm, safe place. I can now work on the next layers of the onion with them. There is a wonderful couple in Durham who have opened up their lives to people in need. What was once a field around their house is turning into a place of safety and compassion. I’m amazed and inspired by them. It reminds me of the movie Field of Dreams. 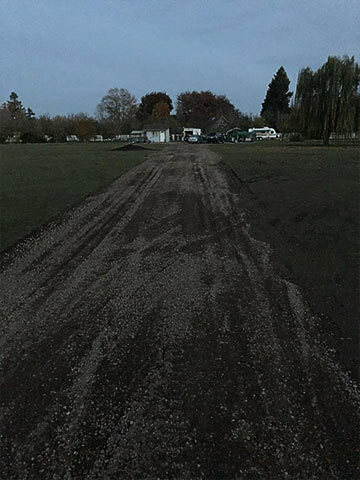 A road has been built, so trailers can move in and out without being hindered by mud. Numerous trailers are arriving. None of this happens without effort and hard work. Your donations have gone to work here. They’re being used to purchase electrical cords and anything needed to set up spaces for families to move into. Your donations, along with others, have helped a young man named Brandon, a fire evacuee, reclaim his self-esteem. His truck is now on the road, helping bring trailers to their new destinations and new families. I have told you that I promised your donations would go into the hands of those in need and I will continue with that commitment to you. There are so many people out there doing great things. My day yesterday was filled with sadness, adrenaline, anger, bewilderment, frustration and moments of quiet, loving silence. Your donations are making a difference and I can’t thank you enough. We talk about what that looks like sometimes and during that short conversation, I can usually apply a simple remedy. It’s not rocket science — I’m just trying to be a critical thinker. So it confuses me why the Salvation Army is reaching out to me. The person on the other line told my assistant that they wanted to talk to me. They wanted to let me know that there will be emergencies in the future and that they wanted to make sure I was on the same page with them going forward. I don’t know if I’m going to return the call. Same page? You got to be kidding. We are not even in the same book.